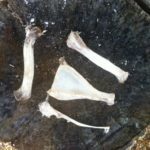 In part one of the series of blogs entitled “Bushcraft Torches and Lanterns” we took a look at the spruce resin lantern. 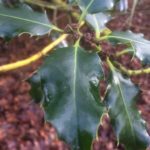 In part two we will be focusing on a native tree to our shores, and one that will be very familiar to practitioners of bushcraft, for a wide variety of reasons. The silver birch tree, Betula pendula and the Downy Birch, Betula pubescens. Either of which are suited to our task. 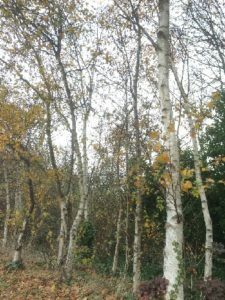 If you find these two are hard to find in your area you could always try an ornamental birch that is a popular choice for developers of comercial spaces, theHimalayan birch Betula utilis. We used this bark to great effect with our concertina designed torch. As with all material collected, ensure you have landowners permission. Once gained, however, it can proove to be an invaluable resource. Birch trees contain flammable oil in their bark, which can be utilised for various tasks. Extracted it can help from waterproofing clothing to rendering it down to form a glue that can be used from sealing our birch bark containers to fletching our arrows. We can utilise this oil without the need to process it, with good effect. We will look at three styles of birch bark lantern to see how they each perform. Firstly we need to collect our birch bark. An effective way to collect a reasonable amount of birch bark is from fallen dead tree. You will be able to happily harvest all the bark the tree has to offer without fear of damaging the tree any further. To get good quality material ensure that the area you are collecting from is off the ground, to avoid moisture been drawn from the ground by the dead tree. 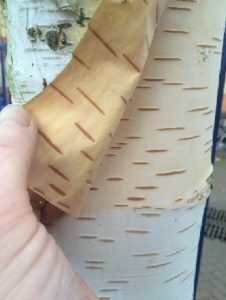 Once you have collected your birch bark you will need a suitable stick that will be used in order for you to mount the birch bark in. Choose a suitable size that will enable you to elevate your torch to the height you desire. For the three designs we are interested in we will need to firstly split one end of the stick and point the other to help drive it into the ground to free our hands for when we want to do other tasks bathed in the light from the torch. The size of the split will be determined by both the design and the size and amount of birch bark you wish to use. Let’s have a look at our three designs. The first consists of taking our birch bark strips and sliding them into your split stick. The more the merrier really, but as a guide about 4, roughly cut to 2” by 6” or whatever you have harvested and placing equal amounts back to back. Build them all the way up the split stick wedging them in. With them all in place drive it into the ground or use another stick and baton to pre-form a hole for your torch to go into. Now all that remains is to light the birch bark and enjoy the light that is emitted from it. 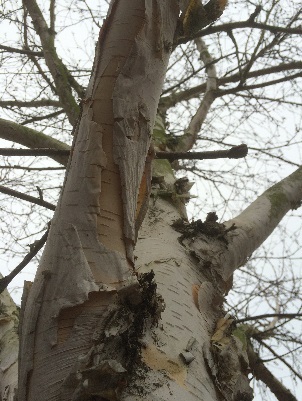 The great thing about birch bark is it is self-feeding when it is alight. You will observe how as the bark burns it curls in on itself, providing more fuel to the flame as it does so. This design utilises this characteristic of the bark to provide a light that is consistent. With just a few strips of bark we used in the torch it happily burned for three minuites. 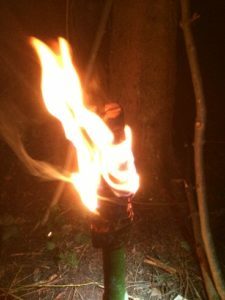 The second design of torch we are going to look at is using a similar split stick and wedging several long lengths of birch bark that are coiled round the pole, a bit like a rag torch. Just as with a rag torch torch a secondary fuel source was used, in this case of animal fat. 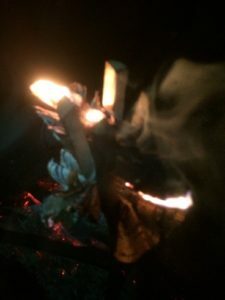 The layers of birch bark did a suitable job of retaining the secondary fuel source which provided a very strong light which burned well for eight minutes. 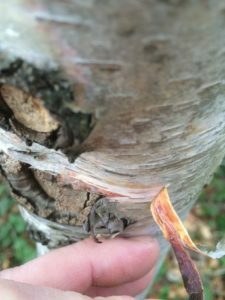 In our third and final torch for this blog we will be forming and mounting the birch bark in a concertina fashion into a split stick. 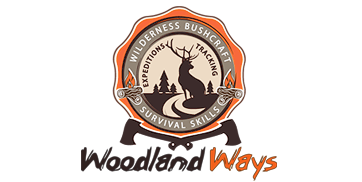 The zig-zag design is designed to resist the bark curling in on itself to provide a longer burn time, but in a reduction of the output of light, obviously the greater or thicker the bark you use then the brighter and longer the burn time you will achieve. The torch pictured here burned for twelve minutes. Not all birch bark will be suited to this design. If the bark has become brittle with age then it is likely that the bark will split along the fold. This will result in the bark curling with the heat of the flame it produces, feeding the flame in the process and negating the benefits of this design. 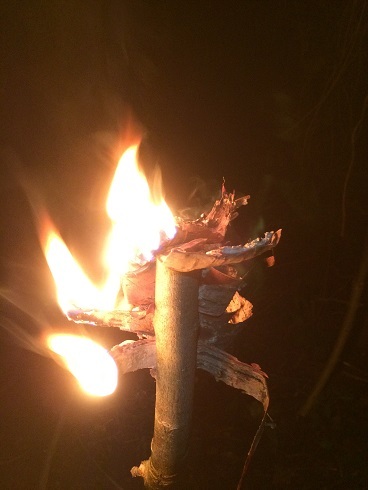 All three ways to utilise birch bark as a torch proved successful. The quality of the bark you have to hand may influence the style of torch you wish to try. It will also have a direct effect on the results you are able to achieve. In the three torches used here the brightest torch was found to be the coiled one which used the animal fat as an additional fuel to the birch oil. The longest burn time was the concertina design, burning five times longer then the first torch using straight strips of birch bark. This extended burn time came with the compromise of reduced light output. For a quick and effective torch with good light for a short amount of time, the first torch worked well. So why not go out and have a try yourself, your results may surprise you. Have a go at some of the different designs and why not try your own alternatives. Be sure to share your results on our Facebook group, we’d love to see them. Previous Post Bone White- How to Easily Clean Bone!